I love to photograph bees and realize that I have not featured one for quite some time. 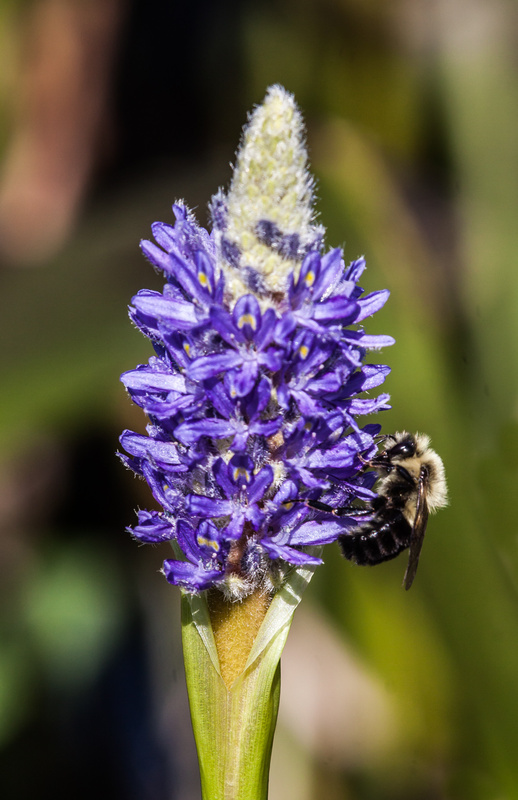 I captured this image of one as it perched on some pickerelweed this past weekend at Ben Brenman Park in Alexandria, VA. In many ways, this image is as much about the flowering plant as it is about the bee. It speaks to me of the interaction between those two main subjects. For me, photographing nature is about balancing the depiction of the small details, as I often do, with the “bigger” picture—the framing of this shot helps to give the viewer a better sense of the environment than if I had done an extreme close-up shot of the bee itself. That’s a great photo, Mike. The bees here are moving slower. Thanks, Dan. We are still warm enough for the bees to be buzzing at full speed, but I suspect that things will change in the next month or so as we move deeper into autumn. I’m surprised pickerel weed is still blooming there. It was finished weeks ago here. You got a nice shot of it, which isn’t always easy without getting wet feet. I’m happy that I was able to identify it. We have had a crazy summer, with a whole lot more rain than usual. I don’t know if it has affected the growing season for plants. I am already starting to see the change of colors in the leaves, so we are starting to move into the autumn season. Are colors peaking there yet? Not yet, they’re actually a little late and are just getting started. We just had the 5th warmest September ever so that might have something to do with it.